Teacher's Manual includes the complete student text followed by translations and answers, rubrics for scoring translation exercises, suggested points for essays, sample essays, and four practice multiple choice exams with answers. Four Latin sight passages with multiple choice questions, along with answer key. Teachers can download these to help students build their Latin comprehension skills. Please note that the vocabulary is missing some entries and has other entries that are not needed for the Latin in the workbook. The more complete vocabulary is available click here to download. 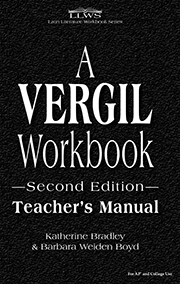 Teacher's Manual Errata, this errata sheet refers to the 2012 printing of A Vergil Workbook 2nd Ed. teacher's manual, click here to download.